For the past few weeks, I have been struggling to dissect the inner turmoil of my reaction to the Trayvon Martin case ruling. I knew it had something to do with the incredibly undeniable dismissal of Sybrina Fulton’s pain. No matter what segment of history you investigate, when you search for Black Women, they, in large, are subjected to a role that is secondary to all other human beings - faces unseen, voices unheard, needs unmet. Even in extreme battles to be an acknowledged presence, more often than not, there is a backlash so stunningly thick with charges of audacity and ungratefulness, the reaction itself takes precedence over the initial movement in the retelling of history. I have been searching for the cause of my anger and anguish as I watched those who so poignantly discussed the living danger to black boys and men, skip over the pain of the mother who sat through the demeaning, heartbreaking trial that rendered her tears and suffering as a showing worthy of uninterested pity at best. I have looked for something to hang my emotions on during this time; searched for somewhere to gain comprehension about this ‘invisibility’ complex I perceived. Instead I found more shunning and staving off of the matter. As they are yet again waved off to the margins through the outcome of the Trayvon Martin case, Black Women were doing what they have always done – concentrating on their sons, husbands, fathers and brothers . Their clawing, scratching and screaming to save the ones they love has, for the most part, always been their only fathomable means to attempt to save themselves. But my question is… When will the Black Woman’s pain be enough to stand on its own and be fought for? When does the fact that she’s hurting, literally dying inside, become valuable enough to those around her to draw acknowledgment and care? When will she be seen as one who deserves to be cared for? I have been wrestling with this and all that it means for me, a Black Woman raising another young, brilliant Black Woman. When will someone stop and look and say, “I see you”? Am I, and all that I carry, truly invisible? What do I teach my daughter about the value of her pain and what to expect as care for it in this society where she is seen as some version of “the help” regardless of her accomplishments and salt is rubbed in her wounds by some of the very ones she will love and treasure most? As I turn these questions over and over and over in me, I am led to recognize how uncaring I have been for myself. The self-perpetuating ideology that ‘Black Women are strong’ and don’t need to be loved and cared for is alive and well in me. This is why I am angry. 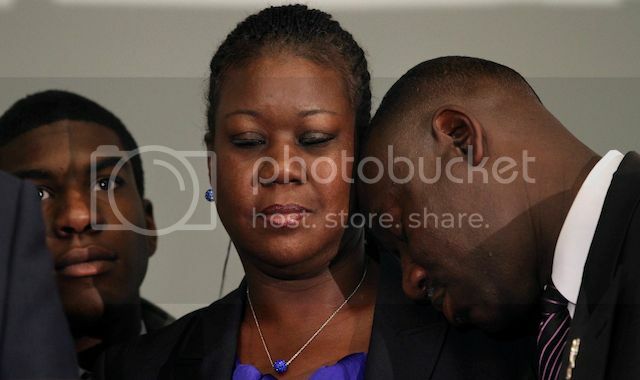 This is why the pain endured by Trayvon’s mother, Sybrina Fulton, is traveling with me; making me feel overwhelmingly livid and the deepest need to weep all at the same time. …we have a bad habit of acting as if black women exist only as props in the story about black men and it’s time to stop. Mychal Denzel Smith’s article entitled “Invisible Women: The Consequences of Forgetting Sybrina Fulton" is one of the few articles I’ve encountered that successfully attempts to bring attention to the existence of Ms. Fulton’s pain ALONE; and it is the only one, so far, that comes close to meeting me where I am with all of this. Smith calls to the table the very essence of my struggle: Black women’s pain and suffering are merely seen as “props” in the history-telling of Black people in America! And based on Simmons’ actions, it is a position in our history that doesn’t even warrant reverence from those who have been covered by our sacrifices, prayers, strength, and willingness to go unseen so that they, themselves, can be seen. A budding scholar and good sister-friend of mine recently said, “Nothing in this nation is going to change until Black Women are allowed to heal.” What a thought - to link the health of an entire nation to the health of Black Women. As I sit and think on my daughter’s future in a land where our deeply-laden voices, bodies, and extensions thereof, have been counted worthless, undesirable (except, of course, for perverted and/or financial pleasures), and vile, I draw back on the lineage of invisible women from which I have descended and I pray such a magnitude of wholeness is possible. Such a magnitude is allowed. Such a magnitude is embraced. Such a magnitude is coming. Lynnett R. Glass is a 2014 Master of Divinity degree candidate at the Candler School of Theology at Emory University. She lives in Metro Atlanta with her amazing daughter, Maya. Her interests include women and religion – (specifically women in the Old Testament and the impact of religion on the relationships/lives of Black Women), Pastoral Care & Counseling, Healing/Reconciliation/Wholeness, along with ridiculously amazing food, great music, wonderful friends and mind-blowing vacations (a.k.a. LIVING)!! !